Whether you have ill-fitted dentures now or you know that your remaining teeth will soon need to be removed, there are options beyond removable dentures. You'll see that you have some really good choices – and there's certain to be a procedure or restoration method that's right for you. Who qualifies for permanent dentures? Permanent dentures are an alternative to removable dentures for missing teeth. Your dentist can tell you if fixed dentures are right for you. While they're more expensive than removable dentures and require mounting on implants that can take a long time to heal, they could be the right course of action for you. That's especially true if there are reasons why removable dentures don't fit well, like bone loss or ridge deterioration. Why do people get removable dentures if permanent ones are available? Removable dentures are considerably less expensive than traditional permanent dentures and even cost less than some of today's modern solutions, which are economical themselves. Some people don't mind removable dentures and can get a good fit, so they're satisfied with this option. Some can't afford something better. How do implants work to replace missing teeth? Implants can be used to replace missing teeth in three ways. First, a single tooth can be replaced with a single implant – a titanium screw that goes into bone and onto which a crown is placed after a lengthy healing process. Second, two or more implants can support a bridge or other restoration that replaces several missing teeth. Third, several implants can be used to mount permanent dentures that replace an entire upper or lower arch. 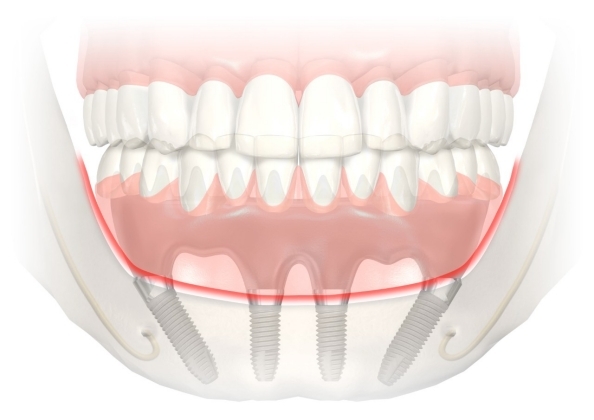 Implant-supported dentures are bridges supported by several implants. Traditionally, these have involved several implants and a long healing time before the permanent dentures can be attached. Today, a procedure called All-on-4 allows the mounting of an entire arch of dentures on a just four posts. And since the back posts are long and angled, bone grafting is not required. This dramatically reduces cost, healing time, pain and time in the dental chair. Who is the All-on-4 procedure for? The All-on-4 alternative to removable dentures and traditional implant-supported fixed dentures is for patients who want permanent dentures with the lowest possible cost, the fewest hassles plus less time in the chair and less time healing. The All-on-4 procedure is for people who are missing all teeth on the top or bottom and need complete arch restoration. How does All-on-4 restoration work? With other permanent dentures, there are usually many implants and a long recovery time. All-on-4 involves just four implants that support the entire top or bottom arch. This includes two short implants in the front and two angled longer implants in the back that go into solid bone for the best possible support. In a single dental visit, you can leave with functional and beautiful teeth. Only a couple of followup appointment are necessary to complete the process. All-on-4 arch restoration is a simple, modern alternative to the way fixed or permanent dentures were attached in the past. Permanent dentures are a significant step up from removable dentures, and the All-on-4 procedure is yet another advancement. If you'd like to learn more about how All-on-4 can improve your appearance, allow you to chew and speak better and help preserve the shape of your face better than dentures, contact us now. We're experts in the All-on-4 procedure and other types of fixed dentures and can help you explore your options. And that's key. You have options. No matter your situation, we can restore dental health, beauty and function for you. It's what we do every day. Call (619) 640-5100 to make your appointment today.